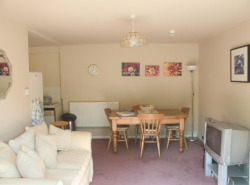 Swiss View is a newly refurbished ground floor self-contained 2-bedroom apartment, sleeps 6. 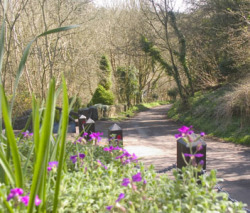 Ideal base for walking holidays or visiting the local area, Cheddar Gorge, Wells (Cathedral city), Priddy (folk festival � July), Axbride, Glastonbury, Longleat Safari Park, Blagdon Lake, Chew Valley Lake & Bath. 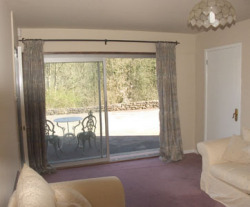 Swiss View sitting room is open plan dining and kitchen area, with large patio window with magnificent views of woodland.The sitting room has a sofa bed, colour TV, DVD, CD-cassette/radio system and games. 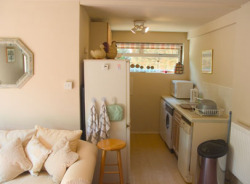 The fully equipped kitchen has dishwasher, washing machine, dryer, fridge/freezer, cooker, microwave, kettle and toaster. Also on the ground floor 2 bedrooms and a bathroom. The double bedroom (off the hall) has a wardrobe/draw unit, double bed and bedside tables. The bathroom (off the hall) has been fully refurbished with bath/Power shower, WC. The 2nd bedroom has a single bed and pull out single bed, side table and views of woodland. Outstanding Natural Beauty, where you'll find many rare species. The Cathedral-like Caves and Britain's biggest Gorge are million-year-old Ice Age river beds. Your ancestors have lived here for 40,000 years, and world-famous Cheddar Man is Britain's oldest complete skeleton. If you'd like to try our RockSport Adventure Activities, view the site. The Avon Ski Centre provides the perfect environment to learn to ski, while also offering a serious challenge to experienced skiers and snowboarders. This is a rural centre and all the usual outdoor pursuits are available such as rock climbing, skateboarding, 4x4 driving, orienteering, archery and many more. Away from the bustling seaside towns, the unspoilt and richly varied Somerset countryside is waiting to be explored. Rural North Somerset takes in the spectacular natural wonders of the Mendip Hills, a designated area of outstanding natural beauty. One of many walks - From Burrington Combe, a steep climb up the side of the Combe then a walk over grassy moorland to Ellick, before climbing to the top of Black Down - the highest point of the Mendips. Through the heather and down Rowberrow Bottom, then a diversion 5 mins up School Lane to the Swan Inn for lunch before rejoining the stream and climbing through the hill-fort of Dolebury. Mendip Spring Golf Club, 10 minutes drive from Swiss View just outside of the lovely town of Congresbury, opened its doors to golfers in 1991, and is now in its 13th year. It is a public pay and play course but to dismay it because of its municipal status would be hugely foolish indeed. It benefits from a fabulous setting, on some luscious parkland turf that is well maintained and manicured by the greenkeeping staff. With a whole host of hazards, particularly, the narrow fairways, well guarded pacy greens, and strategically placed bunkers, it will test every aspect of your game. Must contact in advance for Brinsea and handicap certificate required at weekends.